One of the founders of classical realism was an American political philosopher Hans Morgenthau (1904-1979). His main work is the Politics Among Nations where he states the major principles of his political philosophy. Morgenthau has as his goal the opposition to the overly “optimistic”, in his opinion, understanding of the political processes at the global scale that was common for American political scientists of the first half of the 20th century; and to achieve his objective, he noted in different ways the fundamental principles of political science, stated by Machiavelli and Hobbes. Thus, Morgenthau refreshed the skeptical view of the classical philosophers of political modernity on the subject of human nature itself that, not without the influence of the socialists, started to be understood too enthusiastically. Morgenthau tried to draw attention to the view that human nature is spontaneous and egoistic (Hobbes’ axiom: man is a wolf to another man), and people try to use any situation to satisfy their individual inclinations. That is why any political project, including an international one, must take into account this fact and realize all the risks that appear anytime when a new apparent level of freedom or independence is achieved. So, setting Leviathan free (the State with its legitimate violence) is not only premature, but even not possible in the future, according to Morgenthau, as freedom finds aggressive egoism and is able to destroy any good intentions. That is why Morgenthau suggest following Machiavelli' logic and separate the personal morality from State interests, as well as legal statutes , and take onto account only the two last factors. There is a conclusion, the abandonment of morality in global politics. – the objective existence of force, industrial, military and resources potential. The efficient politician is the person who is able to more correctly realize and implement the national interest. He is playing the role of the firm ground and diligent householder that can take responsibility of tidying the area of the whole State and to stay at the top, managing to achieve defined and declared objectives. The national interest is changing constantly, but practically every time it can be estimated more or less precisely by any State, despite the subjective preference. That is what make the IR in practice a real science, according to Morgenthau. The determination of the national interest is quite a rational process, as well as the result of how one or another governor or politician was able to achieve the defined goal. So in the whole field with national interests crossing with the interactions of national States, the system is appropriate for modeling, rational interpretation, and drafting. Morgenthau stated that the objective law, not good purposes and idealists’ invocations, rule society. However, this takes into consideration that all law allows for the goals more precisely and more efficiently achieved. The main issue and the main criterion of the foreign politics of the State is the question: how does politics influence the interests and the power of the State? If the interests are being achieved, and the power is growing, such a politics is objectively right and successful. How this looks in the eyes of the other actors in the international system, doesn’t really matter, as the principle of sovereignty and chaos in the international system of IR, doesn’t allow for the existence of an institution that can judge and convict the sovereign actors: such a judgment (conviction) limits the sovereignty or is made by other actors that have their own point of view and makes their own estimates, in accordance with its own national interests. Hans Morgenthau is rightly thought of as a classic philosopher of realism in IR, as his works brilliantly and earnestly sum up the main theories and principles of realism in general. An American religious and political activist Reinhold Niebuhr (1892-1971) made a great contribution in to the formation of realism. Being a Protestant pastor, Niebuhr heavily criticized anthropological optimists thinking that “believing in the chance that humankind can be improved is a form of demonic pride”. Instead of it, he concentrated attention on the issue of “original sin” and regarded humankind as a creature directed towards evil. The right strategy for society, under circumstances, according to Niebuhr, is to accept that fact, and towards an expression of modesty and humility, use political instruments not to allow the dark nature to be shown. Such a position was called “Christian realism”. According to it, Niebuhr justified wars, repression, and political persecution of those political and social activists who represent the positions of radical humanism. Niebuhr criticized “liberals”, “utopianists” and “pacifists” that they, he wrote, overrate the human inclination to goodness and its will to create society, based on love and mutual understanding. Instead of it, they open the Pandora’s Box, discovering pride's abyss. That’s why the State policy, as it said Hobbes, Niebuhr finds in it the limitation of freedom of individuals with respect to majority interests. Interpreting his position within the framework of IR, after WW2 he stated his theory that the USSR and its allies must be restrained actively, as they are the carriers of “radical communism”, and offered to make an active and offensive anti-communism the basis of foreign politics for the US and Western countries. The other recognized classical philosopher of the realism in the International Relations is an English scientist, historian and diplomat Edward Hallett Carr (1892-1982). Carr didn’t concern himself as a strict realist, but his position against the liberals in international affairs, his critiques of “utopianism” and optimism over national institutions, effectively pushed him to realism as the accepted science. – “have” countries (the UK, the USA, France, etc, – the winners in WW1) aimed to save status quo, existing balance of power in the international politics, as well as to consolidate the existing order of the things with moral formulas. – “have not” countries (Germany, the USSR, Japan, etc. ), who on the contrary, want to revise the existing order and change the situation to their favor. At the same time, Carr believes that the pacifism of the “have” countries is based on the fact that they are satisfied with the current situation, and the readiness of the “have not” countries – on their aggrieved state. However, both types perform in this way not because of the moral and amoral attitude about international relations, but because of pure national egoism and rational estimation of their own interests. War and peace, in each case, become purely pragmatic decisions of quite a distinct equalization: the first on wanting everything to be unchanged, the second wanting everything to be changed in their favor. The logic lead Carr to recognize the relevance of Marx and Marxism that regarded the relations between the bourgeoisie and the proletariat in the same system. The bourgeois needs order, stability and calmness; the proletariat is able to change their miserable position only during cataclysms, shocks and revolutions. It is realism that tries to interpret the reality of the international system on the other side of “moralistic myths” and “utopia”, and is at the foundation of Edward Carr's interpretation of the USSR's political history that he described in his fourteen volume work, making his one of the most respectable authors on Sovietology. His opponents among the liberals upbraided him for his “sympathy to Lenin and Stalin”, while he tried to find an objective and quite pragmatic logic to the one or other steps of the Soviet authorities, based on the impartial and rational estimates of the national interests. In 1919 Carr, taking part in Paris Peace Conference, predicted the Red Army winning in the Russian Civil War and creation of the rebirth of a powerful and modern statehood. He called on the British government to stop supporting the White Army and start cooperating with the Bolsheviks. Later Carr became close with a Russian social and political activist D. S. Mirsky (1890-1939), one of the creators of the Eurasia movement. It is likely that his acquaintance with Russian culture (Carr had learnt Russian in Ruga and had been reading Russian classic literature) and close friendship with Mirsky influenced Carr’s deep understanding of Soviet politics and the reasonableness of his prediction about the regeneration of the Bolsheviks into one of the most important world players that came after WW2. Raymond Aron (1905-1983) is a French political philosopher and sociologist contributing the creation of IR theory. At the same time, his concepts have a notable sociological character which is usually left out by the pragmatic classical realist of the Anglo-Saxon school. It was a new change in the science. He states his main views and conceptions in his classical book Paix et guerre entre les nations (Peace and War between nations), published for the very first time in 1962, which became a bestseller. Aron bases his analysis on sociology of Max Weber’s and his interpretation of the State as “the only one institution having the right to violence.” Focusing on the principle, he comes up with a realist thesis on anarchy in international relations. Aron states that, being anarchistic, chaotic by its definition, the whole system of international relations can’t conform to a theory with cause-and-effect relations. Instead of the causal approach, he offers to introduce the principle of Weber’s “Verstehen” in sociology to analyze cooperation between States. Such an attitude is not usually to create it as a standard system for State behavior, or with the others under different circumstances, but to help to understand why they act this or that way, to find their true objectives usually hidden by propaganda, eloquence, and ideology. Aron calls such an approach Praxeology, i.e. substantial inductive analysis of the particular praxis. Aron introduces the notion of an “international system” that he defines as a “number of interacting units, being able to be involved into a common war”. Regarding the principal attitude of IR between States, he is considered a classic author for his thought that the possibility of military conflict results from the recognition of the international anarchy. According to Aron, the war can have as its cause the State's desire to increase its power, security, or to gain glory. The first two factors are “objective” and “material”. The third one is part of values. The values, the cultural code and social attitudes, are offered by Aron to be taken into account in identifying national interests along with the material reasons. The international system is characterize mainly by the correlation of the participating powers. Aron believes that the international system can be bipolar and monopolar, as well as homogeneous when they are based on a State with similar political systems, and heterogeneous when the systems and regimes are completely different and even opposite. The stress on sociology, values and cultural codes, made by Aron in his works, separate him from the other classical philosophers in IR, making his closer to the representatives of the English school of IR (H. Bull, M. White). 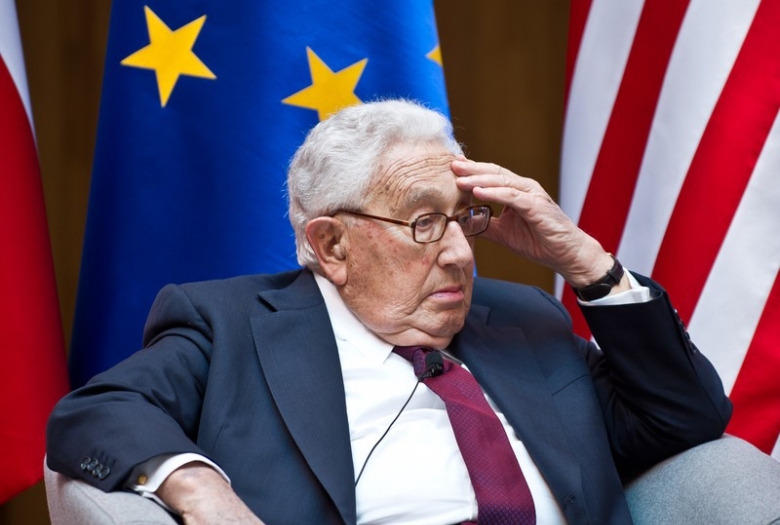 The classical author of realism in IR is the safe and soundly American politician and social activist Henry Kissinger. He is a former US National Security Advisor (1969-1975) and Secretary of State (1973-1976). Kissinger was a very active politician in the 1960's through 90's. This included hiss active role in the relaxation of tensions between the US with Nixon in head and the USSR – with Brezhnev (détente), and the normalization of relations between America and China. Kissinger was not only a politician, but a political philosopher of realism in IR; it is proved by his book where he describes not only the issues of his political career, but detailed theoretical ground of his work on the basis of a particular and considered political philosophy. Kissinger, like the other classical realists, based his on the principle of the national interests and unlimited State sovereign supremacy in the international system. Thus, he completely recognizes the principle of anarchy and does not set the objective to put it in order in one or other of way. Such an approach requires that all States are taken into account are conceptually similar despite their political regime and system, existence or lack of democracy, free market or freedom of speech. Any State for a realist is the rational estimation of its national interests that its political governors try to implement more efficiently. That is why, explains Kissinger, the only factor that must be taken into account is real politics, and if used skillfully, not paying attention to the ideological and moral appearance, it is possible to reach impressive results. Practically applying the realism methods, Kissinger regarded the USSR and China not only as the representatives of a hostile ideology for the US, NATO and the West in general, but as national States with specific national interests, areas of influence and rational goals. Discussing interests under some sort of pure pragmatism with the “ideological adversary”, Kissinger was able to gain in practice a strengthening of US positions in the 20th century. Excluding ideology, morality, respecting human rights, freedoms, etc., allowed him to agree with Moscow, as well as Beijing, which predetermined two major processes in the world politics of the Cold World period: the relaxation of the relations between the USSR in the early 1970's and the USA and normalization of the Chinese-American relations in the early 1970's, that caused the further 1980's reforms in China. Both processes were initiated by Kissinger and went with his active participation. Understanding the real economic issues of the USSR and China and clearly realizing the losses and benefits of the American side such as matching the national interests, Kissinger built the system of the efficient diplomacy that lowered the risks of the nuclear conflict between two powerful State, helped China to integrate into the world economy and, most likely, became the reason for the USSR and Warsaw Pact's dissolution, as Moscow's vigilance was efficiently “lulled” by his realism.